We have a wide selection of brand new High Mass Vestments available in both Gothic & Latin styles, with traditional braided orphreys or embroidered to a wide range of designs. Complete High Mass Sets start at �5 including VAT. We also supply Dalmatics singly, prices starting from �5 for a Dalmatic with Deacon's Stole. Most High Mass Sets are made to order, though we sometimes have sets in stock. 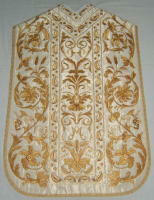 We can also make Vestments to order to other designs of your choosing. GH002. Braided: Brocade. Gold, Green, Purple, Red. �125. (US$1,315) RH003. Quality damask/brocade; bullion braid. White, Gold, Green, Purple, Red, Rose, Black, Marian. GH003. Braided: Quality Damask/Brocade. White, Gold, Green, Purple, Red, Rose, Black, Marian. RH256. Floral Machine embroidered - White. SINGLE DALMATICS: RH263. Gold & Flowers machine embroidered. White, Green, Purple, Red, Rose, Black. Pontifical Dalmatics: All colours: �5. (US$335) RH504. Italian style Hand embroidered. White, Green, Purple, Red. RH558. Marian rich floral hand embroidered - White.